Breaking out in hives is as uncomfortable as it is unsightly. Hives, which are usually triggered by an allergic reaction, are characterized by red, inflamed, itchy bumps of varying sizes. Hives are pretty common, too, affecting up to 20 percent of people according to the Indian Journal of Dermatology¹. And when you get hives anywhere on your body, you’re desperate to get rid of them and prevent them from happening again. Here’s what you need to know before you come down with hives and how to treat future outbreaks. Hives are easy to spot when they happen – they’re telltale red welts that erupt when your body’s cells release histamine and other chemicals into your bloodstream. Hives typically appear when you encounter something you’re allergic to, and they’re your body’s response to fighting the allergen. Most hives breakouts last anywhere from a few hours to several days, and they’re usually nothing to worry about. 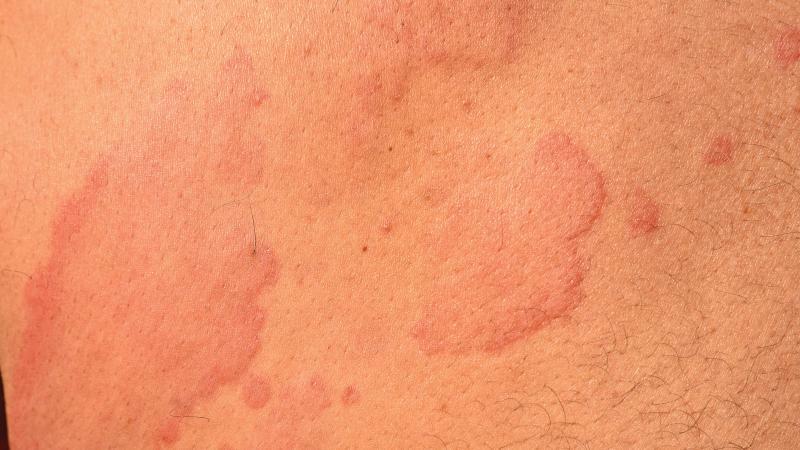 However, it’s important to distinguish hives from other types of rashes. When you’re experiencing hives, the round or oval welts can change; they may fade, reappear, and change in shape and size as your body reacts. Hives can be confined to one area or spread to various parts of the body. If your hives are the result of a serious allergy, they can be accompanied by nausea, vomiting, stomach pain, heartburn, diarrhea, or rapid heartbeat. If you’re getting hives that appear for more than six weeks or continue to appear again and again over months, the condition is chronic and you’ll need to see a doctor. Before deciding on treatment, your doctor will need some information. In addition to asking you when the hives first appeared and what you were doing at the time, they will review your medical history, do a physical exam, and try to determine what’s triggering your hives. You’ll be asked where the welts appear, how long it takes them to fade and whether they are moving or fixed. You’ll be asked about your diet and exercise habits. Be sure to inform your doctor of any medicines, nutritional supplements or herbal remedies that you take. Think about chemicals, such as cleaning products, that you regularly use. No matter the cause of your hives, there are ways to treat this condition and get relief quickly. The most common treatment option is to use antihistamines. Affordable, over-the-counter antihistamines and anti-itching products may ease discomfort and help you sleep. Common brands like Allegra, Claritin, and Zyrtec can all be used to stop itching and slow down the body’s reaction to the cause of your hives. If over-the-counter medications don’t work, you’ll have to try a prescription drug or a combination of several. How Much Does Hives Treatment Cost? How much you’ll spend to treat a case of hives depends on the severity of your condition. Make sure to do your homework before you commit to any type of treatment. The easiest and most affordable hives treatment options are over-the-counter antihistamine medications. These often cost less than $20 and offer you a steady supply of medication you can take any time you have hives. Health insurance plans and Medicare don’t typically cover any of the costs of over-the-counter antihistamines. If you decide to ask your doctor for a prescription medication, your insurance may cover some or all of the cost. Prescription medications can be a more powerful remedy for hives, but they can only work on certain cases of the condition. If you’re interested in learning more about hives, start a search today.